This is the last Holiday Wrap post of the series. Thanks for tagging along! Select magazine pages for their colors and themes. Look for twill tape at your local fabric store. It will often be available in white, natural and black. If you look at a specialty store or online, you will find a large selection of colors, widths, and thicknesses. I ordered mine here. Origami makes a great package-topper. In this case, I folded a magazine page that matches the wrap. I learned how to fold this star here. This particular project was tricky, but there are many great origami tutorials in books and online that are much simpler. The manila tag pictured here is available at most office supply stores. Around the holidays, as online orders start arriving at your doorstep, you may begin to accumulate the brown packing paper that often accompanies these packages. Since the paper is already wrinkled, go ahead and crumple it up even more and then smooth it out. Its surface will be covered with a nice wrinkly texture. This crochet doily is simply attached at the back of the package with double-sided tape. You can use paper doilies in the same way. I used two scraps of fabric as the “tag” on this package. I had no idea how to embroider, but found some simple stitches online. You can do it too! Attach the tag to the doily with a safety pin. Freezer paper, also known as butcher paper, is available next to the plastic bags in most grocery stores. 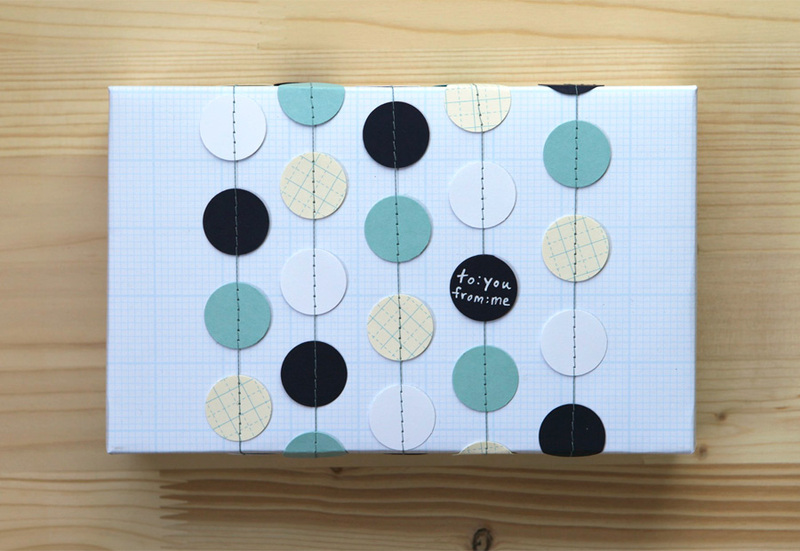 Have you discovered washi tape yet? The idea for this great crafting material is imported from Japan. 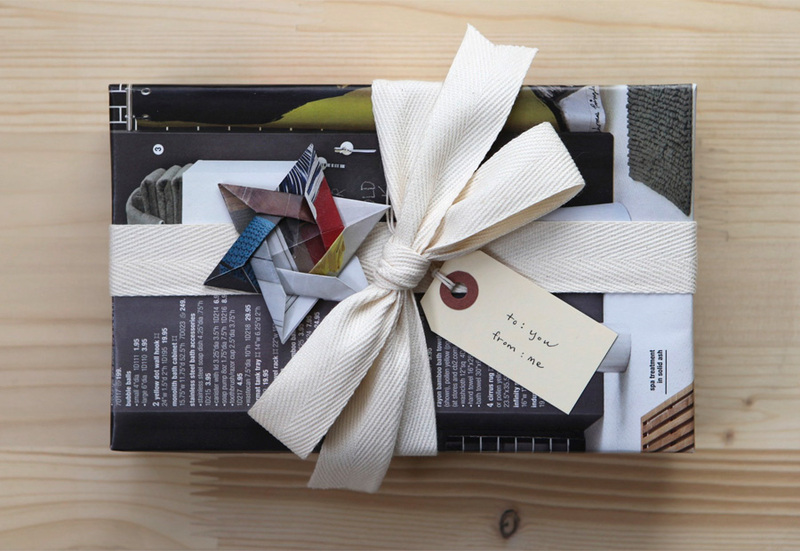 CB2′s website shows several ways to use it to decorate packages. I used three different tapes to outline the edges of this box. I remember my Mom showing me how to make a bow like this years ago. It’s simple and fun! I used strips of green graph paper. To add more color, I attached matching washi tape to some of the paper strips. You can see a step-by-step tutorial here and here. Is your calendar about to expire? 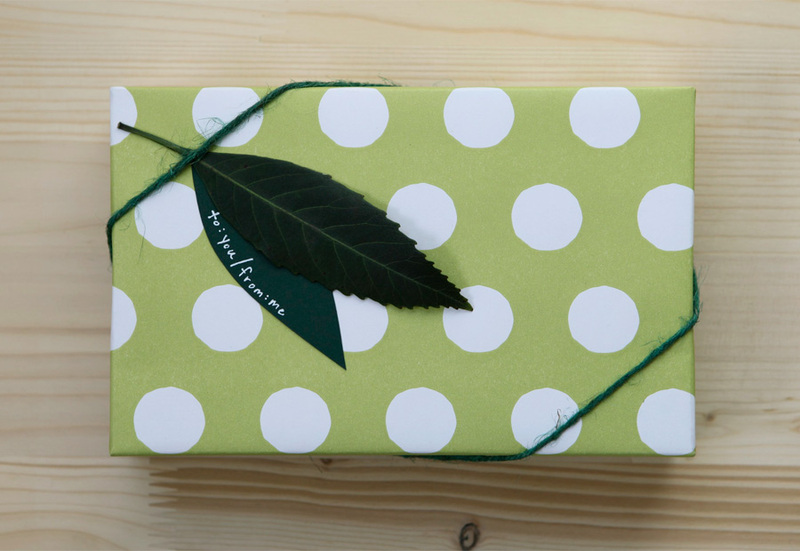 Reuse the images as wrapping paper! 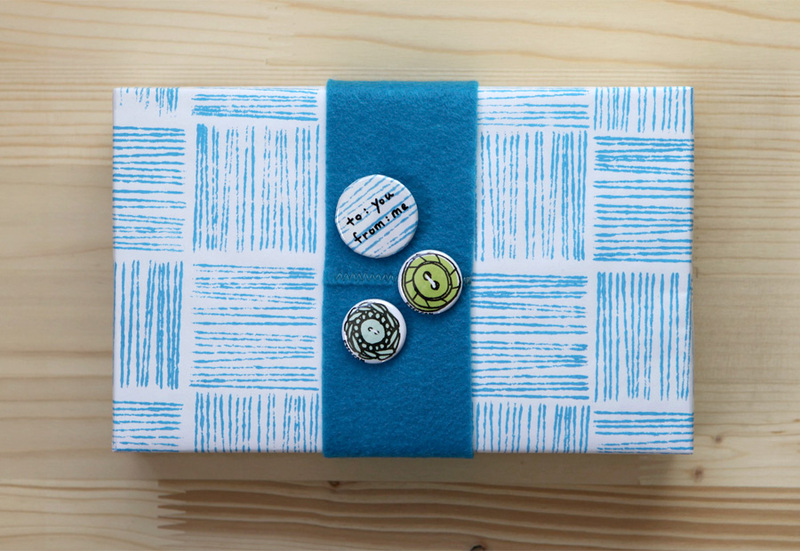 The paper ribbon topping this package is inspired by two great ideas from Bonnie Cauble, a designer at CB2. One idea is to layer and loop strips of paper using double sided tape to stick it down at various points. This gives the ribbon dimension. The other idea is to use various hole punches to punch the top layer, revealing dots of the layer below. I added dots of gold glitter paper for a bit of pizzaz. 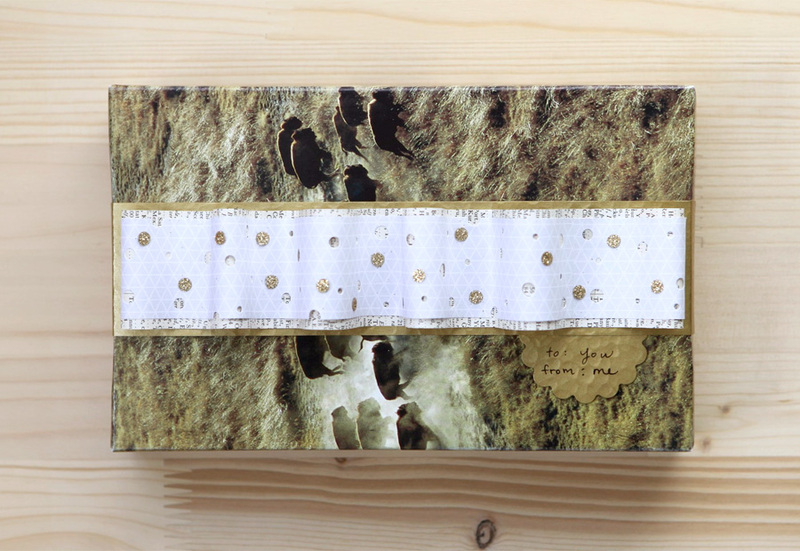 This ribbon combines gray graph paper, a book page, gold scrapbook paper, and gold glitter paper. See more of Bonnie Cauble’s gift wrapping ideas here. 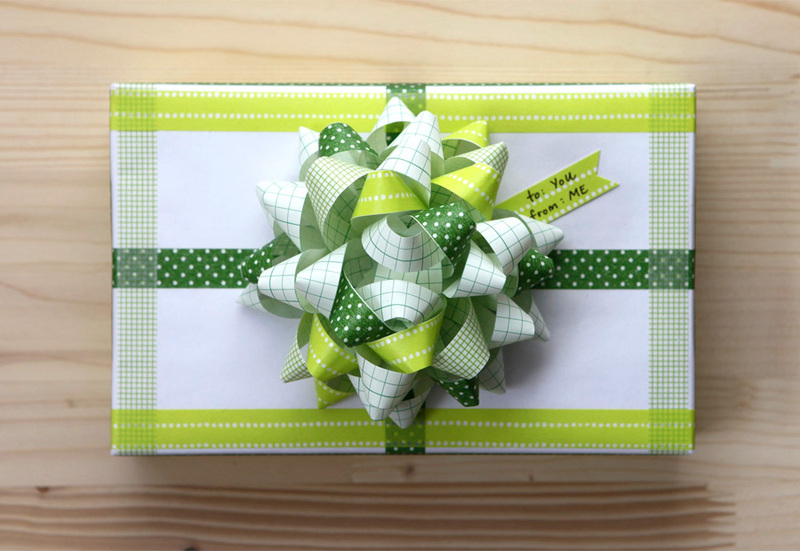 This is a great basic wrapping paper from Paper Source. Find it here. 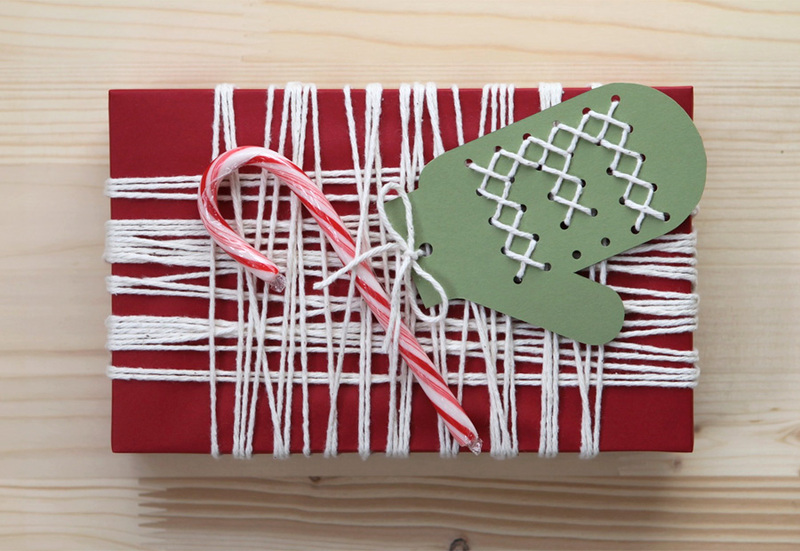 Using lots of yarn to wrap a package is a fun trend. I love the look of carelessly wrapping in both directions. Just be sure to pull the yarn snug enough that it won’t slip off. You can tie the ends together into a knot at the back, or in this case, into a little bow at the front. I discovered several great ideas like this one at M Stetson’s Etsy shop. The cross stitched mitten tag is a great DIY project from Present & Correct. You can find full instructions here. I used matching yarn on card stock. And last but not least, wrapped candy is always fun to tuck on top of a package. Yum! 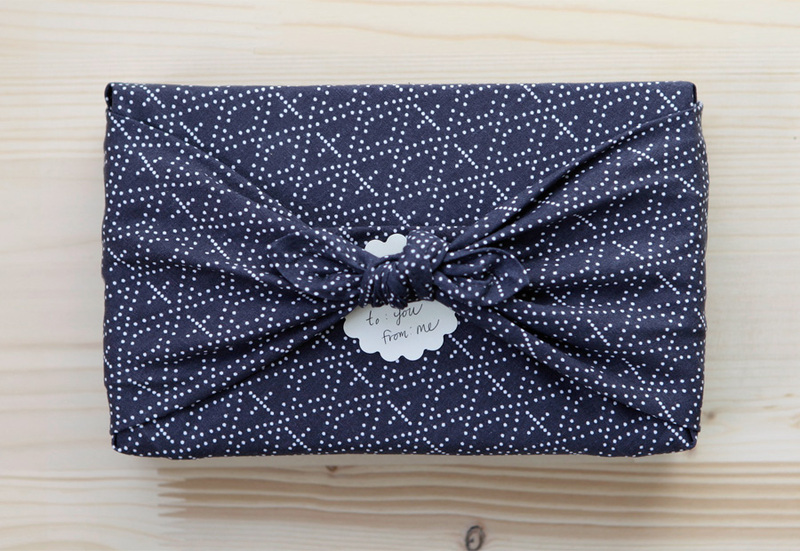 Wrapping gifts with fabric is an art form in and of itself. The Japanese call these fabric wraps furoshiki. You can use squares of fabric, cloth napkins, and scarves as wrappers. This pretty napkin is from West Elm. I learned this method of wrapping from a book titled Wrapagami by Jennifer Playford. Follow one of her video tutorials to see how easy it is. This card stock flower shape is made by a Fiskars punch and attached with double-sided tape. Layer recycled papers onto a package to add interest. 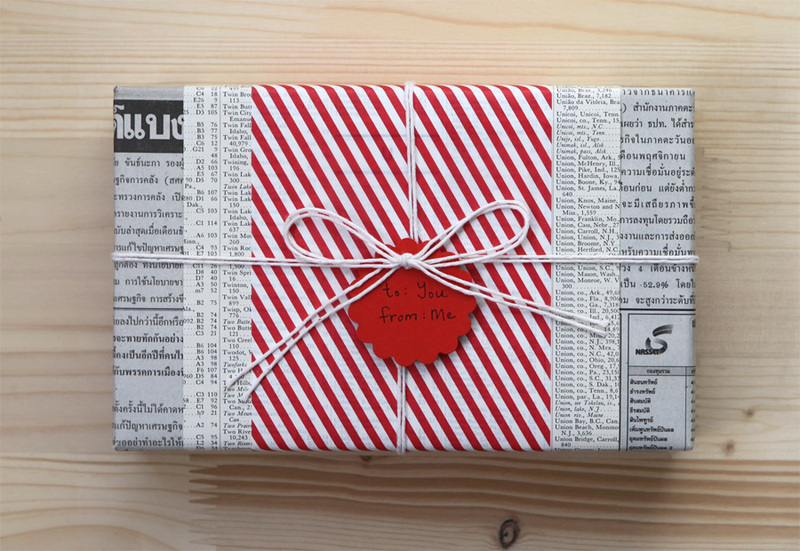 Start by wrapping with newspaper. Cut wide strips of various papers and wrap them around the center, starting with the widest strip and ending with the narrowest strip. Tape each strip down at the back. I found this red and white striped waxed paper at a Michaels Arts & Crafts store. Kitchen twine is a great multi-tasker. You can use it for all kinds of projects. There are many great punches out there. This card stock flower shape is made by a Fiskars punch. Here’s a tip: punch a hole at the top and then make a cut through the top edge of the tag to the punched hole. Gently pull open the cut portion to attach the tag. You won’t see the cut when the tag is in place. Find various types of graph paper at an art supply or office supply store. Sometimes it is even available as large sheets. Either purchase or make your own garland for wrapping and home decorating. Grace Street Paper sells a selection of sweet paper garland. If you are up to it, try making your own. One simple solution is to attach circular stickers along a string. Place two stickers back to back, sandwiching the string between them. To make the garland shown here, you will need a sewing machine. Use a paper punch to punch out circles or shapes from card stock. Gently feed the shapes through the sewing machine, sewing right through the center of each. Leave as little or as much space as you like between each shape. You can find this exact paper at Paper Source. Check your garage, shed, or even your kitchen junk drawer to see if you already have a spool of garden twine. If not, head on down to your favorite home improvement store. Here in California, we still have a few green leaves on the trees. I find them on the ground and place them in books until they are pressed flat and dry. You can also cut simple leaf shapes out of paper and attach them with double-sided tape. 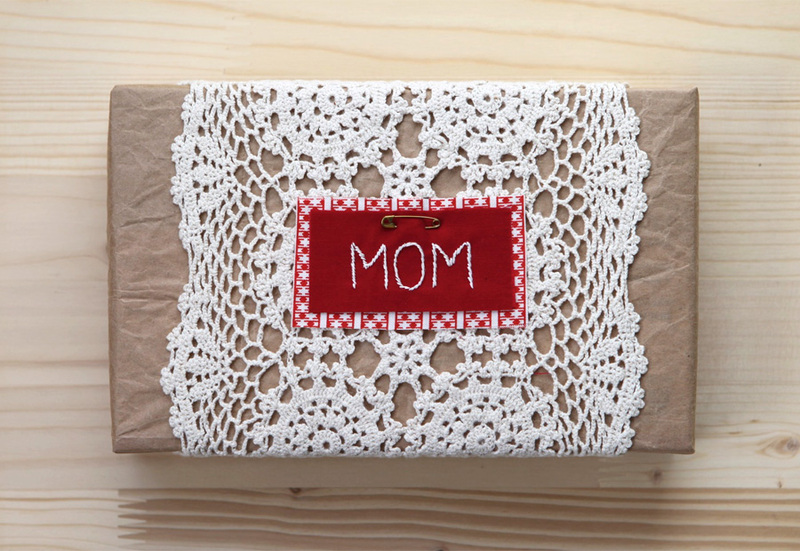 Consider other natural objects to attach to packages, such as sticks, stones, pine branches, and flowers.